Running is a great way to stay fit and get outdoors. However, most people find running difficult and often give up before they even start. Here are some tips to help you become a runner in a few short weeks. Get fitted for running shoes – Investing in the right running shoes will help you run comfortably as well as reduce injury. Set some goals – Although your ultimate goal may be to run a half marathon, you should look at creating smaller goals that will help you stay motivated. An achievable small goal could be to run ten minutes straight. Working towards smaller goals will help you stay motivated and keep you moving forward. Take a running class – Running classes will help you correct your form and ensure that your running style is efficient for long-distance running. Make sure that you research your instructor and that he/she comes recommended. Running apps – There are many running apps like Nike Run Club, Strava, MapMyRun, RunKeeper, that will help you track pace and mileage. You can also share your run with your friends and other fellow runners to keep you motivated. 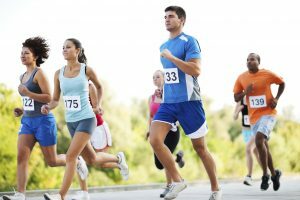 Join a running club – Running clubs are great as they will help you to connect with other runners who are also interested in similar goals. Find a running buddy – A running buddy can keep you motivated and help you enjoy your run more. Don’t compare yourself to other runners – Runners will defer when it comes to pace, time and distance. Comparing yourself to others will not help you reach your goals. Concentrate on bettering your speed, time and distance and congratulate yourself when you have improved.